See the cliff divers of Acapulco and visit the Fort of San Diego, which houses a museum with exhibits on the area's historical highlights. This half-day walking tour takes you around the Zócalo and to the steep ledges of La Quebrada with a guide to watch the popular diving spectacle. After pickup from your hotel or cruise ship terminal, your guide will accompany you to the Fort of San Diego for a tour of its fine museum. 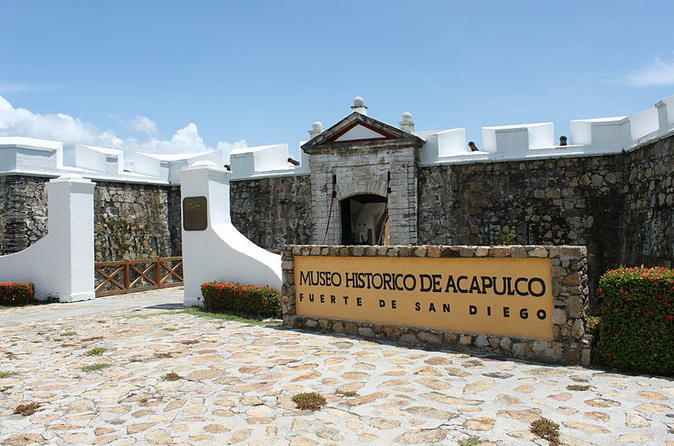 Walk amid well-lit rooms depicting the main themes of the trans-Pacific trade and see historical exhibits about a prior era in the port town of Acapulco, starting with the foundation of the fort built in 1614. Departing the structure with your guide, you'll follow a pedestrian walkway leading to the Zócalo, or central plaza. View the domed, Moorish-style cathedral (La Catedral), constructed in 1936. See the statue on the left tower of San Felipe de Jesús, Mexico’s first saint. Then continue down Hidalgo Street past a number of shops selling religious items. From here it’s about a 15-minute walk to La Quebrada to watch Acapulco's famous cliff divers. On your uphill walk along Avenida López Mateos you’ll pass several family hotels, many with colorful flower designs stenciled on their walls. Follow your guide to La Quebrada where you will see the iconic show of the high cliff divers, while you enjoy a beer or a soda. After the show you will have enjoy time for shopping in a near by store where you will enjoy margaritas, piña coladas or other delicious cocktails. Afterward, a 10-minute walk downhill returns you and your guide to the cathedral and Zócalo, where your tour vehicle transports you back to your hotel.